Falsified antibiotics, snake anti-venoms and painkillers, a Nigerian anti-counterfeit startup, and jail sentences for pharma execs in Benin. Kenya’s drug regulator has warned of falsified and unregistered snake anti-venoms that are being sold in the market. 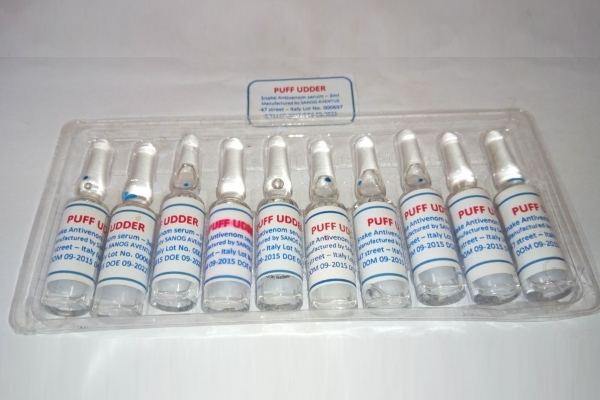 The falsified product (pictured) – which claims to be intended for ‘puff udder’ bites and manufactured by ‘Sanog Aventus’ – has been encountered in packs of 10 vials with the lot number ‘000697’ and expiry date of ‘09-2022’. The unregistered product – labelled as ‘ant venom’ – has no manufacturing, dosage and instruction for use details and is sold in poor quality vials with crude labelling. The Costa Rica Ministry of Health has warned the public that falsified copies of Roche’s antibiotic Rocephin 1g (ceftriaxone) have been found in the supply chain. The antibiotics were reportedly obtained from a doctor in neighbouring Nicaragua, according to a government alert (link in Spanish). The 10 vials of the antibiotic were sent to Roche in Switzerland for analysis and were confirmed to be counterfeit by the pharma company. Furthermore, the quality of the label, vials and closure were not equivalent to genuine Roche products and had a falsified lot number (‘525’) and expiry date (‘06/2020’). Nigerian startup RxAll – which is developing a pharmacy platform for pharma authentication, distribution and primary care in Africa – has been awarded a $150,000 grant from Norway’s Katapult Accelerator programme. The company’s platform uses molecular spectroscopy and a cloud database of spectral signatures of medicines to carry out non-destructive product authentication before drugs are dispensed to patients and is currently operational in Nigeria, Kenya and Singapore. “We are excited by the opportunity to receive additional funding and technical support from the world’s foremost impact accelerator as we expand access to safe medicines across Africa and South-East Asia,” said Adebayo Alonge, co-Founder and CEO of RxAll. A court in the West African nation of Benin has jailed seven local pharmaceutical executives who had been convicted of selling falsified medicines, according to a report in The Citizen news service. The seven were all employed by wholesale pharmaceutical distribution companies and were fined $190,000. The Benin government has also suspended the country’s National Pharmacists’ Association for six months and banned drug supplier New Cesamex – based in DR Congo – from operating in the country. A 15-nation regional body, the Economic Community of West African States, has also launched an investigation into the scandal.